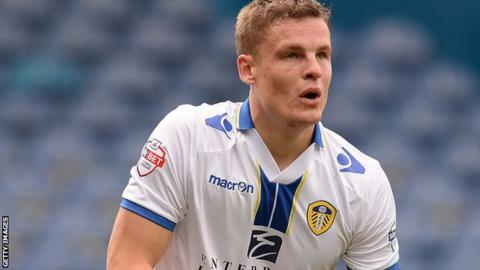 Derby were denied a sixth straight win as Matt Smith earned Leeds a draw in their final game of the season. Simon Dawkins gave the visitors a sixth-minute lead at Elland Road, finishing left-footed past England goalkeeper Jack Butland. Leeds equalised five minutes after half-time when Smith lobbed Lee Grant following good work from Danny Pugh and Ross McCormack. Derby, already assured of third place, will play Brighton in the play-offs. County, whose tally of 84 goals was the highest in the Championship, found chances hard to come by, but by securing a point they set a club record of 85 points in a season. Smith and McCormack forced Grant into good saves as Leeds threatened to take three points. Derby's Patrick Bamford saw an effort saved by the legs of Butland, who spent the latter part of the season on loan from Stoke City. Leeds ended a trying season on and off the pitch with three wins and this draw, leaving them in 15th place, nine points above the relegation zone. Leeds manager Brian McDermott: "Since things have settled down our record equates to 92 points over a season. "There are a lot of reasons for where we finished and they are not excuses." Derby head coach Steve McClaren: "Over the last few weeks we have cemented our place in the play-offs and our level of performance hasn't dropped, but we are taking nothing for granted. "When I took the job I would have said you were mad if you had told me we would finish where we are, but the players have been magnificent." Match ends, Leeds United 1, Derby County 1. Second Half ends, Leeds United 1, Derby County 1. Attempt saved. Ross McCormack (Leeds United) right footed shot from outside the box is saved in the centre of the goal. Assisted by Michael Tonge. Attempt missed. John Eustace (Derby County) left footed shot from outside the box is too high. Assisted by Johnny Russell. Offside, Leeds United. Michael Brown tries a through ball, but Ross McCormack is caught offside. Substitution, Derby County. Johnny Russell replaces Patrick Bamford. Substitution, Derby County. Craig Bryson replaces Jeff Hendrick. Foul by Michael Brown (Leeds United). Attempt saved. Michael Tonge (Leeds United) left footed shot from outside the box is saved in the centre of the goal. Assisted by Ross McCormack. Attempt saved. Ross McCormack (Leeds United) header from the right side of the box is saved in the top centre of the goal. Assisted by Danny Pugh with a cross. Attempt missed. Danny Pugh (Leeds United) header from the centre of the box is close, but misses to the left. Assisted by Matt Smith with a headed pass. Attempt blocked. Aidan White (Leeds United) left footed shot from the right side of the box is blocked. Assisted by Ross McCormack. Patrick Bamford (Derby County) wins a free kick in the defensive half. Corner, Derby County. Conceded by Scott Wootton. Attempt missed. Jeff Hendrick (Derby County) left footed shot from outside the box is too high. Assisted by Patrick Bamford. Attempt missed. Tom Lees (Leeds United) header from the centre of the box is close, but misses to the right. Assisted by Michael Tonge with a cross. Corner, Leeds United. Conceded by Zak Whitbread. Attempt saved. Ross McCormack (Leeds United) right footed shot from outside the box is saved in the top left corner. Zak Whitbread (Derby County) is shown the yellow card for a bad foul. Foul by Zak Whitbread (Derby County). Attempt blocked. Michael Tonge (Leeds United) left footed shot from outside the box is blocked. Assisted by Ross McCormack. Ross McCormack (Leeds United) wins a free kick in the attacking half. Rodolph Austin (Leeds United) wins a free kick in the defensive half. Attempt blocked. Patrick Bamford (Derby County) left footed shot from outside the box is blocked. Assisted by Will Hughes. Foul by Michael Tonge (Leeds United). Attempt missed. Jeff Hendrick (Derby County) right footed shot from outside the box is too high. Assisted by Patrick Bamford. Delay in match Simon Dawkins (Derby County) because of an injury. Attempt blocked. Rodolph Austin (Leeds United) right footed shot from outside the box is blocked. Assisted by Michael Brown. Aidan White (Leeds United) wins a free kick on the right wing. Attempt saved. Patrick Bamford (Derby County) left footed shot from a difficult angle on the left is saved in the bottom left corner. Assisted by Craig Forsyth. Attempt missed. Matt Smith (Leeds United) header from the centre of the box misses to the left. Assisted by Ross McCormack with a cross. Corner, Leeds United. Conceded by Andre Wisdom.